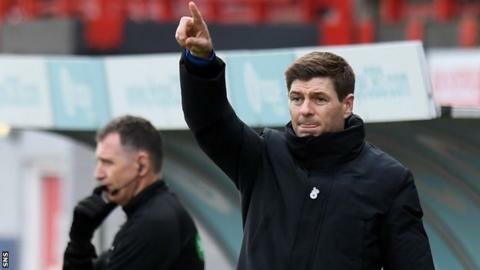 Rangers manager Steven Gerrard has repeated his plea for the club's fans to stop singing an offensive chant about Kilmarnock manager Steve Clarke. Ibrox chairman Dave King apologised to Clarke after he was abused during Kilmarnock's Scottish Cup defeat to Rangers last Wednesday. Gerrard spoke out again after reports of the sectarian chant being repeated during the 5-0 win over Hamilton. "We don't want to hear that or see anything," Gerrard said. Clarke described the abuse at Ibrox as from the "dark ages", while Kilmarnock striker Kris Boyd was also the subject of sectarian abuse during his side's Premiership defeat by Celtic last Sunday at Rugby Park. Clarke and Boyd both called for action on Scottish football's sectarian problems at a press conference on Friday, while Gerrard also urged fans to to stop the chanting. "I was quite clear in my press conference last week," Gerrard said. "There's no place for it. We want it to stop."